Having taken up the fundraising reins about a year ago, I got my start by reading a lot of books and blogs. I met with fundraisers, consultants, non-profit managers, and volunteers. I heard many different tactics, strategies, and advice. I looked at the fundraising activities that we had been doing. I knew right away that they weren’t all effective or efficient. Weeks would be spent planning for a $350 payoff. Meanwhile, a quick phone call could return a $500 donation. Smart fundraisers focus on the activities with the greatest return. They minimize their time and costs while maximizing donations. They start with strategy and decide on tactics. Then they do stuff. In trying to evaluate our activities, I spent a lot of time on planning and deciding on tactics. Too long, actually. I didn’t really do any fundraising. I just pored over my communications strategy, held meetings, and did research. Income received from my strategy, meetings, planning, and research: $0.00. Don’t get me wrong…good strategy and planning can increase your gift levels considerably. Well planned and executed campaigns are far more effective than haphazard desperation. But the most important half of the that campaign is the “executed.” Without execution, you don’t get anything. Here’s a “sample” of some fundraising activities that an organization might do. As you can see, certain activities return more than others. Some of this is the approach, and some of it is the nature of the activity. A well-planned and executed event is going to be much more effective than a last-second silent auction tacked onto a party. 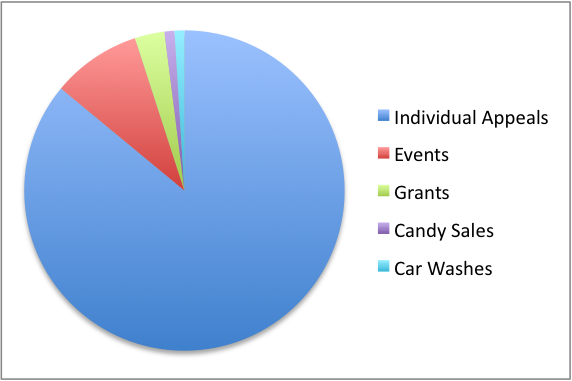 Individuals make up the vast majority of giving in the United States. Not through events, candy sales, or car washes. They give to individual appeals. The best way to raise money is to give an individual a chance to make a difference. Even at events, the most effective are actually just opportunities for you to reach out to more individuals at once. And then appeal to them individually. Organizations try all kinds of gimmicks to get people to donate. They resort to shock advertising or strange events. Social media is great for engagement. It’s great for reaching certain audiences in a way that connects with them. But it isn’t the end. Social media isn’t the same as an ask, and it won’t produce the results of a properly cultivated, engaged, and informed donor. Diversifying your fundraising plan is a good idea, but organizations often have too many events and spend all of their time planning and running small events. One women’s care organization holds one signature event each year, raising nearly all of their operating budget in a single night. They spend a nearly year planning and preparing for it. Last year, they nearly doubled their donations with a couple of major gifts in the following days. 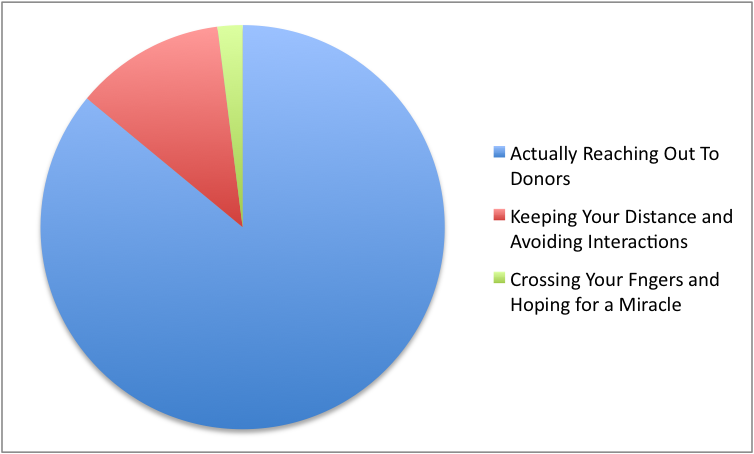 Fear is the biggest reason keeping fundraisers from doing real fundraising. There’s a lot on this topic. People fear rejection. Or they hate begging. Or they’re just not that outgoing, and they are uncomfortable talking to strangers. This fear keeps many fundraisers going back to events and other arm’s-length appeals. If you’re begging, you’re not fundraising. That’s because begging is desperation. Instead, fundraising is the appeal for an investment. You’re looking for investors: people who understand the need, align with your mission, and are willing to help fix the problem. The worst thing you’ll hear is “no.” It happens a lot. But your chances get a lot better with practice and training. Spend the time to learn how to properly cultivate, engage, and steward your donors. You’ll find it gets easier, and it gets results. The development process takes time. After the fear of fundraising, time is the number two reason that people resort to less effective tactics. Developing a major gift requires a strong relationship and trust. These things do not happen overnight. Be patient and fill the gaps with your events and other fundraisers, but don’t let yourself believe that they are the most important. Make a goal to call or visit one person each a day or week – not just prospects, but call or visit current donors to thank them. Create milestones so you can measure yourself against your fundraising goals. Find a mentor who can help you learn the ropes and bring him or her along on a fundraising visit. Interview your largest donors about why they give. Ask them to recommend potential donors. Make sure you have given first. If you’re not willing to invest in your mission, it’s hard for you to convince others to give.